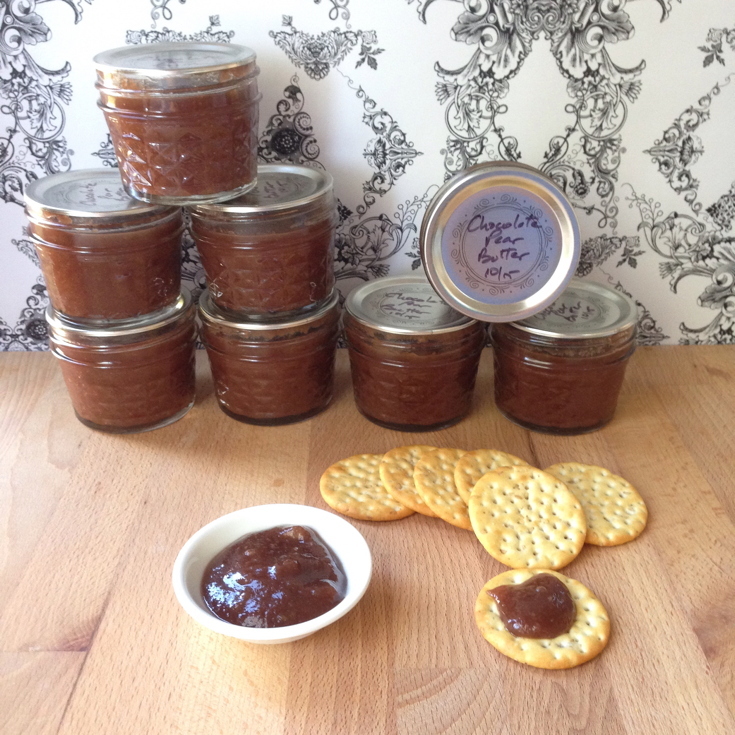 Chocolate Pear Butter - Get the Good Stuff! You might think that Autumn marks the end of the canning season - but it's not so! Pears are lovely in jars: halved, sliced, or in jam. This excellent chocolate-tinged pear butter is a special treat, whether for gifts, or used on special occasions. Recipes get passed around, and change as they go. This jam is a case in point: it is my own version of a splendid recipe from Marisa McClellan’s second book, Preserving by the Pint, which is itself inspired by a British book, Notes from the Jam Cupboard, by Mary Tregellas. I keep up with Marisa’s doings at her blog, Food in Jars. Thank you, Marisa! This one’s a fabulous jam. So, on to the jam itself. Pears and chocolate are a classical combination. I like to make this jam in little 4-ounce jars, which are perfect for little gifts. Start with 3 pounds of pears, and get 8 or 9 little jars! Cut the cores from the pears, but do not peel them, as you chose pears with thin skins. Chop them into small dice. Put in a non-reactive saucepan – my favorite is a 4-quart wide pot – and add sugar and lemon juice, Stir well to combine and set aside. Prepare a boiling water bath: in a large pot with a rack, place 9 clean 4-ounce jars. Fill the pot with water to cover, and bring to a boil. Once the water has boiled, turn the heat to low, and keep everything hot. Have clean lids and bands ready to use. Put the pot of pears over medium-high heat, and bring the fruit to a boil, stirring regularly. Cook it until it bubbles and looks thick, which will take 10 minutes or so. When the pears become translucent and tender, remove the pot from the heat. Whiz the pears with an immersion (stick) blender, until it is smooth and free of lumps. Return the pot to the heat. Cook until the pear butter is the thickness you prefer. I like to dab a spoonful on a chilled saucer and let it rest a minute or two. If I can drag my finger through the blob, and the edges don’t fill in the clean streak, I call it done. Also see the wrinkle test. When the jam is at the stage you like, remove it from the heat. Stir in the cocoa powder, and keep stirring until it is fully absorbed and well distributed throughout. Ladle the chocolate pear butter into prepared jars, leaving ½ inch (12mm) headspace. Wipe rims, and apply lids and bands. Anything that won’t fit in your jars can go into a clean custard cup – chill it in the fridge, and call it the cook’s treat. All recipes have to start somewhere, with an idea or a plan. My immersion blender has had a workout this year – the smooth fruit butter texture is perfect for a preserve with subtle flavor. We find that this jam starts with a hit of pear, and finishes with a lingering taste of chocolate. Thanks!